For a child with hearing problems, the ability to socialize and communicate is even more important, and children's books about hearing loss often help children accept and cope with this disability. Parents and educators often turn to children's books about hearing loss because they serve as a means for reassuring and educating a child about his or her hearing disability. Numerous books available deal with this topic. 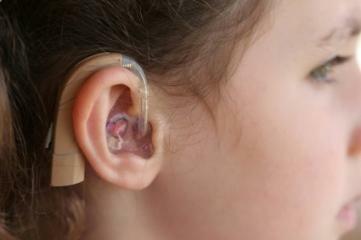 While some of books deal with educational info, others focus on fictional characters who are also dealing with hearing loss. The following children's picture books about hearing loss are suitable for children ages four to eight years old. A Button in Her Ear by Ada Basseett Litchfield is a wonderful picture book featuring a young girl named Angela. The book tells the story of the discovery of her hearing disability and her adjustment to wearing a hearing aid. Crocodile Meatloaf by Nancy Simpson Levene is a chapter book that chronicles the life of Rachel, a deaf girl who has recently entered the sixth grade. Going with the Flow by Claire Blatchford is a story about Mark, whose embarrassment over his deafness and anger over changing schools brings about a new awareness of himself and adjustment to his new surroundings. I Have a Sister, My Sister is Deaf by Jeanne Whitehouse Peterson describes the life of a young girl and her younger deaf sister. The book is an excellent selection for siblings of deaf children. I'm Deaf, and It's Okay by Lorraine Aseltine is a children's picture book about a young boy who acts out his feelings of disappointment and unhappiness over his deafness. The following children's books on hearing loss are suitable for kids who are ages 9 through 12. Buttons: The Dog Who Was More Than a Friend by Linda Yeatman is the story of a Buttons, a puppy that bonds with a deaf boy named Phillip and Phillip's family. Can You Feel the Thunder by Lynn E. McElfresh relates the story of 13 year old Mic Parsons and his struggle to accept his conflicting feelings towards his deaf and blind sister. Cheshire Moon by Nancy Butts is a chapter book that deals with the death of a hearing-impaired girl's best friend and the choices she makes in the aftermath of this tragedy. Hue and Cry by Elizabeth Yates is set in an 1830s New Hampshire community. It's the story of a deaf girl named Melody and her budding friendship with a young Irish immigrant who has been labeled a thief. Jessi's Secret Language by Ann M. Martin is one of the books from The Baby-Sitters Club series and chronicles the story of club member, Jessi, who begins to learn sign language as she baby-sits for a deaf boy and his hearing sister. Muddy Four Paws by Jean Ure tells the story of how 11-year old Clara and her best friend rescue a dog that has something very special in common with her younger hearing-impaired brother, Benjy. Nick's Mission is another book by Clair Blatchford. This mystery revolves around sixth grader, Nick, and his dog as they discover dangerous smugglers in their area. The following books are suitable for teens. Missing by Kate Chester is part of a detective series and focuses on the main character, Sara Howell, who is a smart, beautiful, and deaf detective. Is That You Miss Blue? by M. E. Kerr introduces Flanders Brown and her new friend Agnes Thatcher, a deaf girl, as they adjust to life at a girls' boarding school. Season of Change by Lois L. R. Hodge chronicles the life of 13-year old hearing-impaired Biney Richmond as she wades through the hazards of life as a young teen. These are just a few of the many children's books related to hearing loss. If you have other books you would like to suggest please do so in the comments section of this article.